Mid-air interactions are prone to fatigue and lead to a feeling of heaviness in the upper limbs, a condition casually termed as the gorilla-arm effect. Designers have often associated limitations of their mid-air interactions with arm fatigue, but do not possess a quantitative method to assess and therefore mitigate it. In this project we investigate a novel metric, Consumed Endurance (CE), derived from the biomechanical structure of the upper arm and aimed at characterizing the gorilla-arm effect. Hincapié-Ramos, J.D., Guo, X., Moghadasian, P. and Irani. P. 2014. 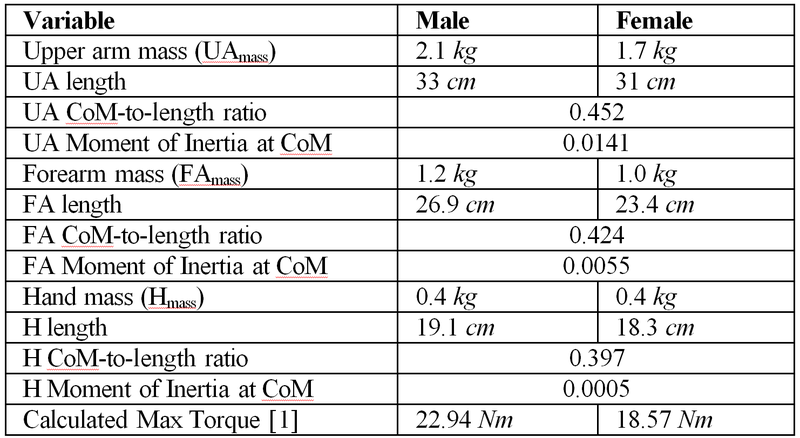 Consumed Endurance: A Metric to Quantify Arm Fatigue of Mid-Air Interactions. In Proc. CHI '14, ACM. We present a method to capture CE in a non-intrusive manner using an off-the-shelf camera-based skeleton tracking system, and demonstrate that CE correlates strongly with the Borg CR10 scale of perceived exertion. We show how designers can use CE as a complementary metric for evaluating existing and designing novel mid-air interactions, including tasks with repetitive input such as mid-air text-entry. Finally, we propose a series of guidelines for the design of fatigue-efficient mid-air interfaces. The following table presents the standard values at the 50th percentile for males and females, as compiled by Freivalds . - Tan, H., Radcliffe, J., Ga, B. N., Tan, H. Z., Eberman, B., Srinivasan, M. A., and Cheng, B. Human factors for the design of force-reflecting haptic interfaces. - Freivalds, A. Biomechanics of the Upper Limbs: Mechanics, Modeling, and Musculoskeletal Injuries, 1 ed. CRC Press, June 2004.